Price: $15.99 plus sales tax and shipping. When corresponding with the university, write to the specific office, college or department. Although every effort has been made to assure the accuracy of the information in this catalog, students and others who use this catalog should note that laws, rules and policies change from time to time and that these changes may alter the information contained in this publication. Changes may come in the form of statutes enacted by the Legislature, rules and policies adopted by the Board of Trustees of the California State University, Chancellor or designee of the California State University, or President or designee of the campus. It is not possible in a publication of this size to include all of the rules, policies and other information that pertain to students, the institution and the California State University. More current or complete information may be obtained from the appropriate department, school or administrative office. Nothing in this catalog shall be construed as, operate as, or have the effect of an abridgment or a limitation of any rights, powers or privileges of the Board of Trustees of the California State University, Chancellor of the California State University, or President of the campus. The Trustees, Chancellor, and President are authorized by law to adopt, amend or repeal rules and policies that apply to students. This catalog does not constitute a contract or the terms and conditions of a contract between the student and the institution or the California State University. The relationship of the student to the institution is one governed by statute, rules and policy adopted by the Legislature, Trustees, Chancellor, President and their duly authorized designees. 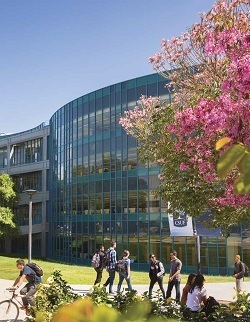 The California State University, Fullerton catalog is prepared by the Office of Strategic Communications and the Office of Academic Programs.